FORNEBU S IS A SHOPPING MALL LOCATED IN A COMBINED COMMERCIAL AND RESIDENTIAL AREA JUST OUTSIDE OF OSLO. This extensive development is on a brownfield site, home of the largest airport in Norway until 1998, and is predicted to be as large as a medium-sized Norwegian city by 2020. The building is owned and run by KLP Eiendom, and houses more than 80 shops and restaurants with a total area of 65 000 m2, including parking. It is the first shopping mall to receive BREEAM Outstanding certification. The mall is part of a larger development on the site also owned by KLP Eiendom. A building next to it will host a bank, a medical centre and a gym, and above the shopping centre there are 81 apartments. By establishing a local service centre in this developing area, the need for CO2 emitting transportation will be reduced. KLP Eiendom is a long-term owner and operator of commercial buildings with a strong focus on conducting business in a sustainable way. The parent company, KLP, has corporate social responsibility as one of its core values. KLP Eiendom strives to be a leader in the Scandinavian market when it comes to sustainability, so it was therefore natural to aim high when developing Fornebu S. At an early phase BREEAM was considered to be a good framework for creating a project with a broad range of sustainable solutions. To make this a green flagship project in the portfolio, the bar was raised high and the target of BREEAM Outstanding set. Environmental expertise and experience of sustainable construction were important criteria when choosing the contractor for the project. With Skanska the project team was strengthen by solid experience and expertise of sustainable solutions and BREEAM certification. The major achievement is the sum of many different sustainability features from the start of the development all the way through the building phase, displaying a constant focus on sustainable solutions, suppliers and products. Because of this, the project has scored highly in all of the different BREEAM categories (ranging from 67 % in the Materials category to 100 % in Landscape & ecology and Management). comprehensive metering and an energy monitoring system to help optimise energy and water use. The calculated amount of energy consumed in the building is 85.9 kWh/m2 (according to NS 3701), which is about a 60% reduction against the regulatory level. more than 80% of the wood materials are PEFC or FSC certified. The green roof is not just a green roof but a replica of the nationally rare natural habitat called Lowland Calcareous Grassland, found naturally in the Fornebu area. 84 different plant species make up the green roof, some of which were cultivated from seeds collected in the natural habitats around Fornebu during the summer of 2013. As a result the roof will help to maintain corridors of this habitat and support local biodiversity, whilst giving the residents in the apartments above the roof something colourful and pleasing to look at. In addition there are bike parking facilities, 20 EV parking lots, a dog parking facility with lockable cages, and water leakage protection in the toilet areas. 100 % of the construction waste has been reused or recycled for new materials or energy. Education – efforts have also been made to display the qualities of the building to the public, and the local community is invited to use the centre as a learning facility for energy and environmental issues. The amount of solar power generated in the previous 24 hours is displayed at the heart of the centre, and this is compared to energy use in common applications such as washing machines or airplane flights. “Environmental Stations” containing easily accessible information about the environmental features of the building itself, its energy use and other facts, are found in the common areas. “The Environmental Trail” is a game you can play on a cell phone, which will take you around the centre asking questions and providing information about energy and other environmental issues. The youngest children have their own paper version in a form of a treasure hunt called “The Environmental Hunt”. Fornebu S also offers guided tours of the complex to show why the centre is “the world’s most sustainable shopping mall”, to school classes and other interested groups. KLP Eiendom have engaged in a partnership with the world’s only environmental organization solely for kids, “The Environmental Agents” (Miljøagentene in Norwegian), who will help to keep the educational program at Fornebu S updated. For this particular project, the use of large scale low carbon concrete in nearly all of the concrete cast on site has been a very successful learning experience, which will be followed in future projects. The regime of strictly controlling the materials sourced and ultimately entering the building site is one that is replicable and leads to better control and higher overall quality – and could and should be used for all future projects regardless of BREEAM assessment. 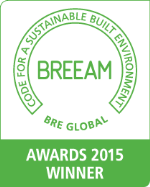 The whole idea of BREEAM leads to better planning and that less ad-hoc solutions.